The McClain varisty wrestling team gathers for a picture at Jackson High School where they opened their season with a second place finish in the American Legion Post 81 Invitational. 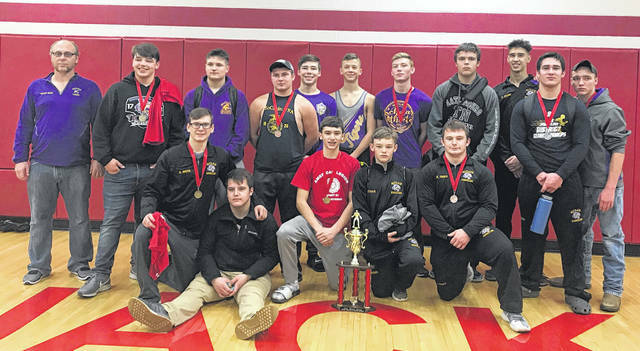 JACKSON — The McClain Tigers wrestling team returned to Jackson to start the season once again to participate in the American Legion Post 81 Invitational. This year’s field consisted of 11 teams with the top three teams bringing home trophies, and the top three wrestlers in each weight class medaling. Canal Winchester, a division 1 team, battled McClain all day, swapping first and second place throughout the day. CW, with a strong team from top to bottom outlasted the squad from McClain who had two wrestlers in their starting lineup who are new to the sport. CW took home the first place trophy. McClain got the runner up trophy, and Jackson overtook River Valley in the final round, to keep the third place trophy at Jackson High School. Three Tigers lead the way for MHS by winning their weight classes: (120 pounds) Lucas Jansen, (145) Quinton Smith, and (285) Kade Rawlins. Phil Waters (195) was able to earn a second place medal. Four Tigers were able to get the third place medal for their weight classes: (132) Dawson Jansen, (138) Jacob Krafthefer, (170) Tanner Tite, and (220) Kyler Trefz. Ethan Burns (126) went 2-3 as the point scorer and Aidan Salyers (126) as the non point scorer also went 2-3. Both of these 126 pounders won their first career varsity matches, with Aidan winning the first match of his life. Nathan Franz (152) went 3-2. Caleb Goddard (160) won both his first varsity match and the first match of his life, going 1-2 for the tournament. Parker Chaney (182), being new to the sport, went 0-5 on the day, but picked up valuable varsity experience along the way. Justin Kegley (220), wrestling as a non point scorer, put in a very nice effort going 3-2 and kept opponents from scoring team points by doing so. The Tigers will take a week off from competition and will return to action on December 12 at Zane Trace High School, where Amanda Clearcreek will join in the action to make it a tri match. These will be the first dual matches of the year for MHS, which is what counts towards the team’s record for the year. Zane Trace and Amanda Clearcreek both have excellent varsity wrestling teams making this a chance for anyone wanting to see some good wrestling, the opportunity to do so. Shane Paul the head wrestling coach for McClain High School submitted this story.